Zelaya’s critics, which include the most powerful sectors in Honduras, say he was removed from office because a non-binding referendum on opening up the process of a Constitutional Assembly was illegal. Reports of US involvement emerged immediately: the plane that flew Zelaya out of the country stopped to fuel up at Palmerola, a joint US-Honduras air base less than 100km from Tegucigalpa. Shortly after the coup, powerful pro-coup Hondurans sent a delegation to the US and hired lobbyists in Washington, DC. US trade and commercial interests with the small Central American country abound. But the extent to which countries like Italy, South Korea, Taiwan and Canada, all of which have significant trade and investment links with Honduras are connected to the coup has remained largely unexplored. In Canada, with the exception of a few editorials in the mainstream media, little attention has been paid to what is certainly one of the most important events in the hemisphere over the last decade. While Canada’s links to Central America are much less significant than those of the US, they are still worth exploring. Far from calling for the return of Zelaya to power and condemning the military’s actions, Canada’s good-neighbour ambiguity has ignored the violence unleashed by the coup regime, and the position of organizations such as the UN General Assembly, whose members demanded that Zelaya be allowed to return to the presidency. Canada also declined to condemn the military and the coup government after massive peaceful resistance marches across Honduras were violently repressed by the coup regime, which also moved to temporarily shut down radio and TV stations critical of the coup. Detentions, torture, disappearances, beatings and murders of anti-coup activists have continued unabated since the coup. “We are faced with a situation that’s very delicate, where there was a military coup, where a president is named, and then there is a second coup, which was the election, the fraudulent election,” he said in an interview at his clinic in Tegucigalpa. Almendares points out that the same soldiers that have beaten, tortured and killed Hondurans were responsible for guarding the ballot boxes on November 29. “There is no doubt that there was fraud, because they were illegitimate elections,” said Almendares. Regardless, Canada’s Junior Foreign Minister Peter Kent’s praise for the country’s controversial elections was glowing. “While Sunday’s elections were not monitored by international organizations such as the Organization of American States, we are encouraged by reports from civil society organizations that there was a strong turnout for the elections, that they appear to have been run freely and fairly and that there was no major violence,” said Kent. Laudatory press releases aside, Canada has yet to formally recognize the elections, which it will not be required to do until January 27, inauguration day for President-Elect Porifio Lobo. Honduran media report that Kent continues to pressure Lobo to find a way to remove de facto President Roberto Micheletti from office before that date. Honduras is one of the Canadian International Development Agency’s (CIDA) target countries, and the top recipient of Canadian development funds in Central America. In 2007-2008, CIDA disbursed $17.9 million in government-to-government aid to Honduras. In addition, the Canadian Department of Foreign Affairs and International Trade disburses part of their Counter- Terrorism Capacity Building Fund, destined for police training, to Honduras, and the Department of National Defence runs a Military Training Program that includes the participation of Honduran soldiers. On the financial front, it is possible that Canadian companies active in Honduras will see an improved investment climate stemming from the political crisis. 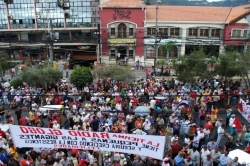 The corporate sector in Honduras, which includes national and foreign businesses with operations in the country, supported the coup, as did the military establishment and religious institutions. A leaked June 26 memo from the Chamber of Commerce in Tegucigalpa asked members to donate amounts upwards of $1,000 “in defence of democracy and social and economic liberties” two days before the military removed Zelaya to Costa Rica. Canadian corporations such as Montreal-based Gildan Activewear and Scarborough-based label maker Mayfair Canada are members of the Honduran Manufacturing Association (AHM), which itself is a member of COHEP. They are joined by Calgary’s Merendon, a jewelry company whose directors are charged with defrauding shareholders in what the RCMP have called one of the biggest Ponzi schemes in Canadian history. Canadian investments in Honduras are not limited to the manufacturing sector. Mining corporations Yamana Gold, Breakwater Resources and Goldcorp all have investments in the country, and all three companies are members of a national metal mining association, ANAMIMH, which is also affiliated with COHEP. The coup came before the final reading of a new mining law before congress, which would have restricted mining in the country and banned the use of cyanide in Honduras. “The [mining] law was proposed to favour communities, but the mining companies have turned it around,” said environmentalist Carlos Amador in an interview at his home in El Porvenir. He expects the law that will be passed in 2010 by Lobo’s government to be the opposite of the proposal, and encourage more large-scale, transnational mining in Honduras. “It’s like in 1998 when [Hurricane] Mitch hit Honduras: they’re saying that the only way to improve the Honduran economy is to open the doors to investment in mining,” said Amador. Canadian exports to Honduras in 2008 were worth $86,850,495, and imports from Honduras $151,574,812, amounts that have grown steadily over the last 60 years. Honduras was the last country in Latin America with which Canada reached a “most-favoured-nation” agreement, which was signed in Tegucigalpa 1956 by Canada’s then-ambassador to Cuba. Most-favoured-nation deals were predecessors of modern-day free trade agreements, designed to reduce tariffs and eliminate trade barriers. At that time, Canada was exporting about half a million dollars a year in goods to Honduras, mostly in leather, flour, tires and powdered milk. A full 90 per cent of Honduran exports to Canada were bananas, worth closer to a million dollars annually. By 1975, Canadian exports to Honduras were worth $8.1 million, climbing to $24.2 million by 1980. Negotiations for a free trade agreement between Canada and four countries of Central America (Guatemala, Honduras, Nicaragua and El Salvador) began in 2001. Negotiators last met in February 2009, but according to Foreign Affairs Canada there are no more rounds of negotiation planned at this time. Dawn Paley is a journalist based in Vancouver.